A new plugin for WordPress displays tracking data from Google Analytics, WordPress and MailChimp, all integrated together into a single WordPress dashboard. The plugin is provided free of charge by MailChimp and can be downloaded at the wordpress.org plugin directory . A MailChimp account is not required to access the Google Analytics information. The Analytics360 Plugin provides a comprehensive view of a blog’s performances, allowing publishers to quickly identify which posts are enjoying the most inbound traffic whether from web site referrals or by email. The traffic-over-time chart shows when a post was published or an email campaign was sent in relation to the numbers of site visits, giving a clear view on cause and effect. Google Analytics is rich with information. This plugin accesses the most relevant information for a blogger and displays it in an actionable way. For example the plugin displays all blog referral sources and provides a drill down path showing the most popular posts. The plugin also includes a world map. Hovering over a country shows the number of blog visitors from that country. Analytics360 provides real-time access to both Google Analytics and MailChimp allowing for instant date range changes. MailChimp supports email for many blogs with a free RSS-to-Email option that updates subscribers whenever a new post is published. MailChimp also developed a simple to install WordPress plugin to manage email list signups. The Analytics360 plugin was developed for MailChimp by Crowd Favorite using the Google visualization toolset for rendering the dashboard charts. The plugin will work in the self-hosted versions of WordPress including the multi-user version. In order to take advantage of this plugin, subscribers need to be running Google Analytics on their WordPress site already. Then all they have to do is download and install the Analytics360 plugin and enter their MailChimp and Google Analytics login info. MailChimp takes care of the rest. MailChimp, a leading do-it-yourself marketing service, provides tools to over 80,000 small businesses, design agencies, non-profits, restaurants, and e-Commerce organizations worldwide. Customers can create professional, eye-catching HTML emails in minutes with easy-to-use web based tools. MailChimp offers a completely free account for users with 100 subscribers or less, and for larger accounts offers two affordable pricing programs: monthly and pay-as-you-go. 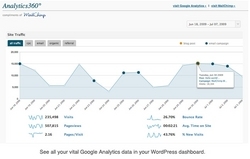 This entry was posted in Which Open Source Blog and tagged Analytics, Dashboard, Displays, Google, Plugin, Stats, WordPress on July 20, 2012 by Administrator.